For the best adventures, use the best map. Fully detailed Mallorca adventures with our new Mallorca North & Mountains Tour & Trail Super-Durable Map 7th edition by David Brawn and Walk! Mallorca guide book by Charles Davis. 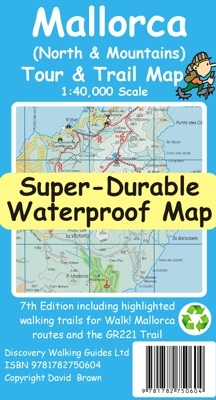 Our 7th edition gives you a super detailed, up to date, map of the Tramuntana region stretching from Peguera-Costa Calma- Santa Ponca in the west then running along the mountainous region to the very tip of the Formentor peninsula at Cap Formentor. Note this is not a map of all of Mallorca. With a size of 1,080mm by 600mm at 40,000 scale on a double sided map sheet you get a lot of Mallorca on this map while still being easy to read thanks to our Tour & Trail design standards. Those essential features of petrol stations, refreshment stops, miradors and off-road parking are easily seen while our background altitude shading plus 50 and 100 metre contours and spot heights bring this beautiful landscape to life. Special 'concertina map fold' means your map unfolds quickly, and more importantly folds back to its compact pocket size easily and quickly. Super-Durable means we have printed the map on 'Polyart' to produce a lightweight map that feels like silk but is as tough as old boots to outlast the worst of conditions and fold up like new after every use.